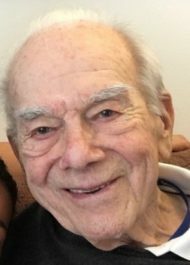 Eugene I Rhodes, 94, formerly of Florida and New York, passed away at Brethren Village on Sunday, January 13, 2019. He was born in Brooklyn, NY to the late Joseph and Sylvia Rosenfeld. Gene celebrated 73 years of marriage with his wife Lenore Kaplan Rhodes last September 21st. He served in the US Army during WWII as a Private First Class. Following his Army discharge, Gene graduated from Ohio State University and then The City College of New York with a master’s degree in civil engineering. In the 1960’s he designed a desalinization plant for the island of Java (Indonesia) and lived there with the family while the plant was being built. Upon returning to the United States, Gene built a successful engineer consulting firm in New York City. Gene was a very positive thinker who was proud of his accomplishments as well as his family. Classical music, opera and photography were some of his passions. He took advantage of all the cultural events that were readily available in NYC. Gene and Lenore travelled throughout the Far East and Europe. In addition to his loving wife Lenore, Gene is survived by their three daughters: Terry, wife of Geoff Lewis of Washington, DC and Cushing, ME, Dory Rhodes of Forest Hills, Queens, NY and Joan, wife of Larry Sherman of Lancaster, PA; five grandchildren, and seven great-grandchildren. A gathering will take place 1-1:30 PM, followed by a time of sharing at 1:30 PM, on Wednesday, January 16th at the Charles F. Snyder, Jr. Funeral Home & Crematory, 3110 Lititz Pike, Lititz, PA 17543. Interment will be private. In lieu of flowers, memorial contributions may be made to Hospice & Community Care, P.O. Box 4125, Lancaster, PA 17604-4125.